Well the Texas trip started even before we left! All the planning, hard work, expectations gone in less then six seconds! Our friends from Hurricane Country, started their road trip before us. Right out of the gate, they ran at Nashville. (See their recap at jetdragster.blogspot.com) The moon & stars were misaligned, and tap it was over. Everyone was okay, but just a little less straight! That knocked the plan for a loop, and set in motion 12 months of renewed trash talking!! (A year ago, the same race I had to back out from engine damage, and had to endure a year of "Too Scared to run them") But all joking aside, we are glad everyone was okay. 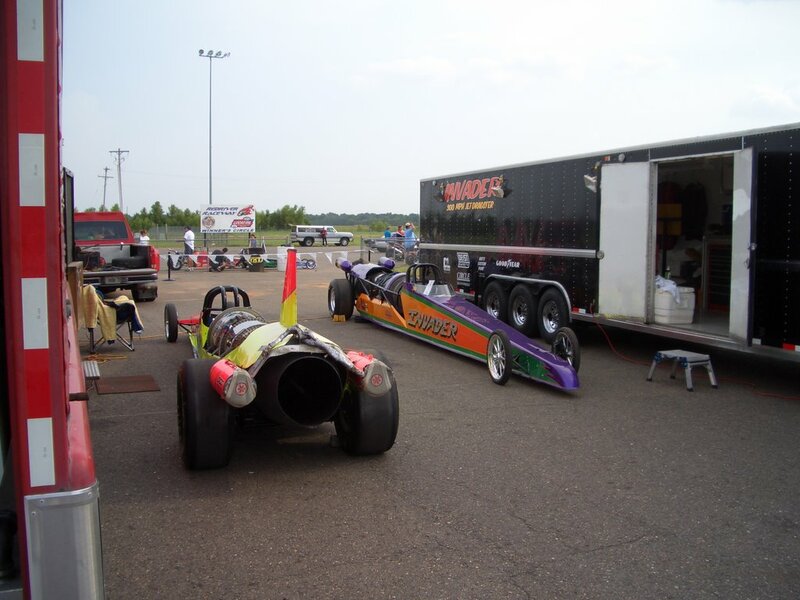 SO we head out on the 2nd of August to hit the two races, Texas Raceway & Red River Raceway. The family stayed home, and it was just my dad and Craig, my brother. Of course as everywhere in the country there is a heat wave this summer, and the truck's air conditioning was not up to par. It would cycle through cold and cool! After the 1000 mile plus trip to Kennedale, we finally made it on Thursday afternoon. 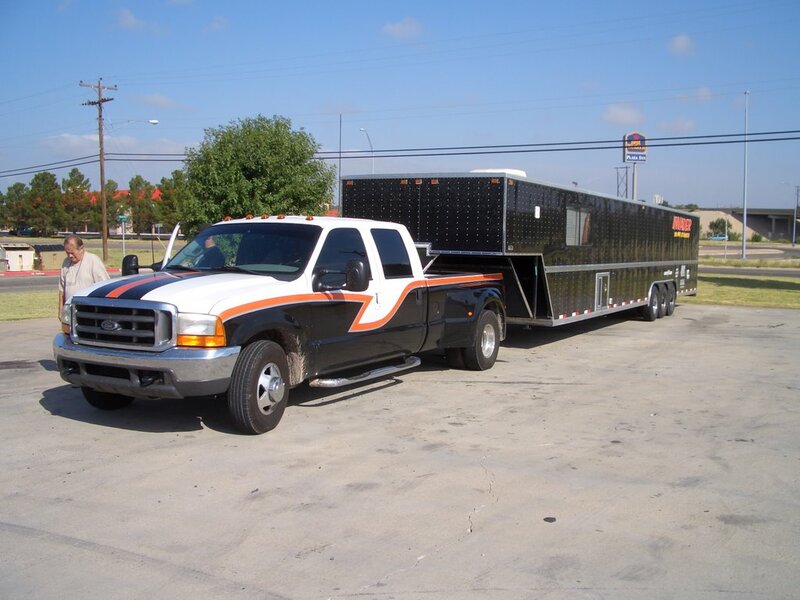 Driving out to the track to wash the rig and drop the trailer for the night, we were able to see Texas Raceway for the first time. Driving down this green grass and tree lined road surrounded by home, we thought we were lost. But after closer inspection of the houses, we realized this was a racers dream! The homes had huge shops, rigs, and car in the driveways. Some of the homes actually over looked the racetrack! Also just down the street was a circle track, so just about all tastes were covered. 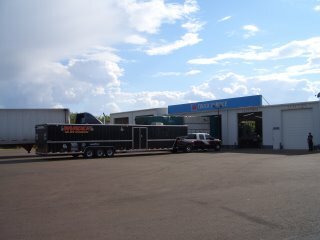 After the rig was scrubbed clean, we headed back to the hotel for some rest. Leaving for the track on Friday we noticed the brakes were growling, and stopped to pick up some parts to repair the front brakes, also checked to the air conditioning. Well, the air conditioner compressor was intermittent, but at the huge price they wanted to fix it, we decided to wait until we get home. After repairing the brakes, we talked with Dan Sullivan from Chicago. He is an old friend of my dad, who has helped us out before. He brought down the Chicago Rush J-60 powered jet dragster. We went over the show for the night, and talked about how to run on the 1/8 mile track. The Texas heat was in full blast, well into the 100's with 60% humidity. Now if you have never run an 1/8 mile track before, it is definitely a different experience. The finish line had yellow flags to mark it, and scoreboards at 1000 feet. 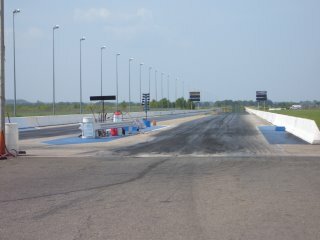 The track had plenty of shutdown and actually turned to the left in a banked turn at the end. The first pass was hard for me, trying to get in sync wi th a different driver for the show, slid in too fast to stage and the worst thing was I shut off early! I was looking so hard for the flags, I thought I missed them and shut off. But just as I did, here are the flags! Another cool thing was after I went passed the finish line; I could read my ET on the boards as I flew by. The first round went to Dan, so the second round I cut a good light and he almost went by at the lights. I really did not know who won until we saw the time slips. After we ran, and the show was over, the temperatures started cooling off. We loaded the car & headed out to Louisiana. Red River Raceway was the next night and only about 220 miles from Kennedale. Crossing the border, and heading north out of Shreveport, again beautiful country roads were met with scorching humid heat! 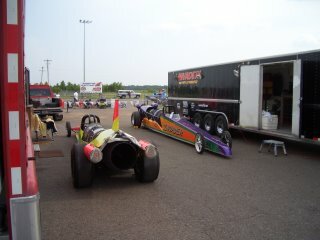 Red River Raceway and everyone there was super, treating us like long lost friends. The track was great and had just over a half mile of shutdown. Again Dan & I prepared the cars for the first round at 8 pm. At the scheduled time to pull in the lanes, I stepped out of the trailer in my safety gear to be greeted by the first few drops of RAIN! Within ten minutes, it was all over the rain was a hard steady rain, and darkness had fallen! The race was called and eventually rescheduled, but not for us. We have to be back on the West Coast. 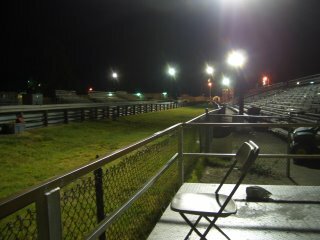 As we pulled out of the track later that evening, we were pretty upset that we could not have put on the show for all the great people there! With the 1300 mile trip ahead of us, it was time to put the pedal to the metal. All was good until, Dallas! Bam! Tread separation on the inside right rear of the dually. So let’s see, one destroyed tire, one mangled mud flap, one tweaked fender support, and three hot & sweaty crew! We were really lucky that the fender was not ripped off. A check of the tire pressures and inspection of the tread we pressed on. With the Texas highway going on forever, we finally reached El Paso for fuel at midnight. We again headed out and then 6 miles out of Las Cruses, BAM! The inside LEFT rear tire separated, and more damage. This total, one destroyed tire, one missing mud flap, one tweaked fender support, all trailer plug wires ripped out, and three hot sweaty and angry crew! Let’s see, one am on the side of Interstate 10, trucks whipping by, no lights trying to fix it to limp into Las Cruses. After getting to town and parking in front of Discount Tire, we were done for the night. Tires replaced, fueled, fed and rested, we finally crossed the finish line at home.